Communication is a two-way street. Your organization has a message to “sell”. Fine. But this means that your “clients” (stakeholders, MEP’s, the public opinion) must be set in a position where they are ready to “buy” whatever interesting information you want to promote. And this requires some engineering. That’s where the communication agency should provide an added value. On top : the “what’s in it for me” approach invites the reader to get involved. 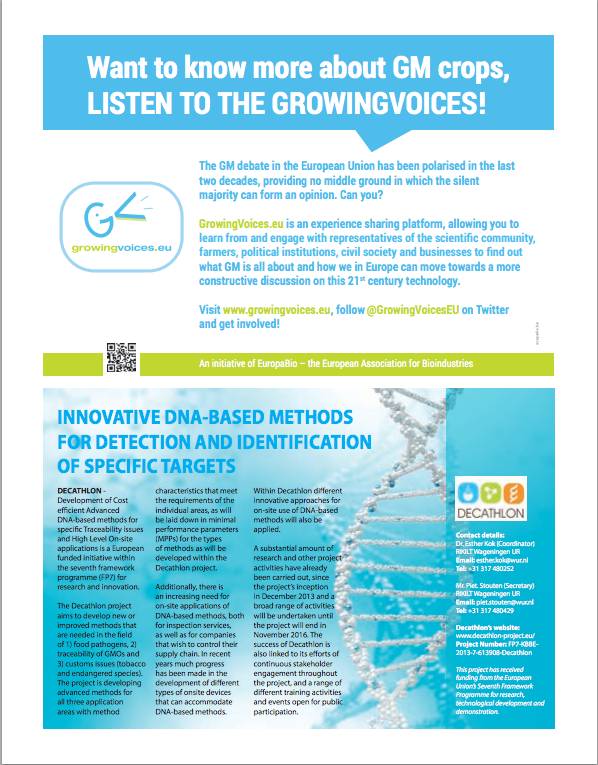 A couple of weeks ago, we created and published an ad for the EuropaBio GrowingVoices campaign in Parliament Magazine. It was displayed on top of another advertisement that promoted “Innovative DNA-based methods for detection and identification of specific targets” , which is certainly interesting. But as the title is already technical, few people will read the full contents. Also, as the ad does not contain any invitation to learn more, they will stop there. Besides, the text is quite long. At first sight, this ad says : “I’m going to inform you about a very technical point, be ready to read a complicated text”. If the advertiser only wished to inform those who really want that information in particular, it’s ok. But if the idea was to convince people who are not 100% at home with these scientific concepts, we doubt that the efficiency requirements will be met. Corporate culture is good for everything. Except in communication. This kind of “put-as-much-as-you-can-in-our-ad-we-pay-for-half-a-page-so-let’s-fill-it” bias is nothing new to us. It is a result of the illusion that your message is so incredibly interesting that everyone will rush to the page where it is displayed and read it with interest and passion. Although this illusion satisfies the “corporate culture” of your organization (convincing the staff and members that “your message” is the most important one in the wold is a decent and required way to mobilize them), it is a hinder to reaching the real objective of communication : creating an interesting event for the reader. Corporate Culture is necessary for any organization’s efficient management. But it is also one of the main obstacles on the road to an efficient communication. Because your readers are not involved in it. So, when trying to reach the outside world, you need to get rid of what you unconsciously are literally immersed in daily. And that is Corporate Culture! Our role as a communication agency is to translate whatever you want to say in terms that can lead the reader to action. We must understand your corporate culture, respect it, be in tune with it so we can express it through design and tone of voice. But regarding the message you want to promote, however, the communication agency’s role is to reduce it and translate it to answer the “what’s in it for me?” question. You are talking to human beings, not technocrats ! A reader is also always a human being. Even the most technocratic technocrats have a human brain and a human heart. Each of us is confronted to hundreds of promotional messages every day. To make your message interesting, you need to appeal to basic human emotions. For the GrowingVoices ad, we decided to address the viewers’ curiosity. “Want to know more about GM crops,” is a sentence that indicates that there is “more to know”. The reader is lead to wonder what that more to know is. And indeed, everyone heard the critics on biotechnologies. But who has looked at the advantages of GM crops? Have you? Probably not. Would you like to? Well, that’s a possibility we invest in! So, the first part of the title is a “call for interest”. Then comes the “call for action”. We started the second sentence with one of the 6 (human) senses : “Listen”. Senses are the link to the exterior world. Only two of them are used to gather intellectual knowledge : sound and sight. Logically, the GrowingVoices campaign lead us to choose the verb “to listen”. The second sentence also adds an information which may not be immediately detectable : if there are “growing voices”, it means that there is news. So “listen to the GrowingVoices” appeals to another human reflex: the need to know. Knowledge involves the instincts of safety and survival. Knowledge is crucial when dealing with controversial subjects. Is it safe for me to eat GMO’s? Is it reasonable to think that organic food can save people? What is the added value of GM food in case of drought? Can traditional agriculture cope with global warming effects? These questions are simply vital. The more you have to say, the less you should write. Our body copy is quite short and links to internet and social media. This is not because our client has few things to say, but because we filtered the global, intricate and rich contents of the GrowingVoices’ message to concentrate on what one can achieve with a single ad. Globally, the body copy says : “You thought you knew, well you didn’t. If you really want to know, this is the place to go”. All the rest of the information is available on the web site. This is a result of a strategic media planning done both by us and by our client : put the right part of the message in the right place. The call for action is the only thing we put in this ad. Because there is only one thing you can sell to non-initiated readers on half-a-page : in advertising, it is called a USP (Unique Selling Proposition). If you add one or more messages to the USP, you do not inform more, you actually inform (much) less. 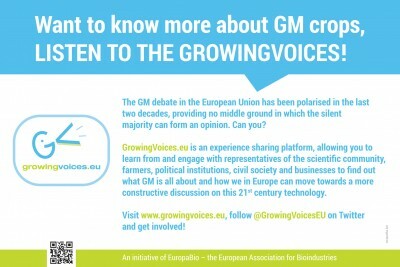 And by the way, if you want to know more about GM crops, visit the GrowingVoices web site. Another production by Acapella, brilliantly filled-in by EuropaBio! You found this article interesting ? Share it !